With plenty of hard work, the company has grown over 40 years to include Honda, Mazda, Kia and a pair of Nissan dealerships. There are five Carstar collision centres under the Centennial banner thanks to New Brunswick expansion, plus Auto-Sport & Tire power-sports stores in Charlottetown and Summerside. Much more than two brothers, Centennial now employs over 170 people. Seven members of the team have been with Centennial for more than 30 years. 40 years on, Ira and Ezra play pivotal daily roles in the business, but the company also includes numerous other members of the family, including four managing partners from the next generation. 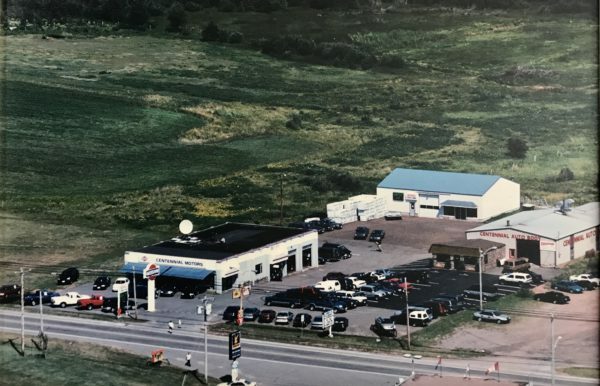 Centennial Nissan and Centennial Auto Body on South Drive in Summerside in the mid 90s. Centennial obtained the Honda dealership in 1999, adopted Carstar branding in 2004, and began a rapid acquisition phase in 2014.